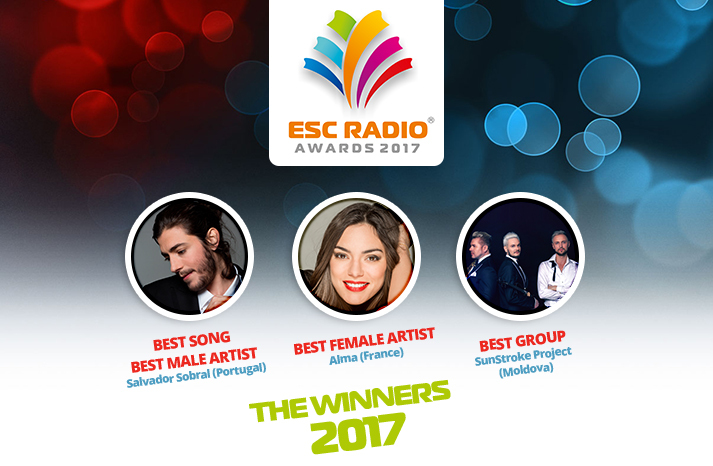 For the first time since 2012, the Eurovision Song Contest winner also wins the ESC Radio Awards poll: We have a double victory for Portugal with Amar Pelos Dois winning the Best Song award and Salvador Sobral Best Male Artist. Amar Pelos Dois, written by Luisa Sobral, gained 16.6% of the vote while Salvador Sobral won the Best Male Artist category with 17.5%. Congratulations to Luisa and Salvador Sobral! Runner-up in the Best Song voting is Bulgaria’s entry Beautiful Mess by Kristian Kostov who also came second in Best Male Artist. Italy’s Francesco Gabbani and Occidentali’s Karma follow in third place, respectively. Two songs that didn’t even make it to the Grand Final at Kyiv finished in the Top 10: Estonia’s Verona by Koit Toome & Laura came eighth and Finland’s entry Blackbird by Norma John finished in tenth place. In the Best Female Artist category the trophy goes to Alma from France. She gained 18.5% of the vote, beating Belgium’s Blanche into second place (14.6%). Third place goes to Lucie Jones from the United Kingdom. It’s the first time for France to win an ESC Radio Award. In last year’s poll, Amir and his entry J’ai Cherché were narrowly beaten into second place in both Best Song and Best Male Artist. 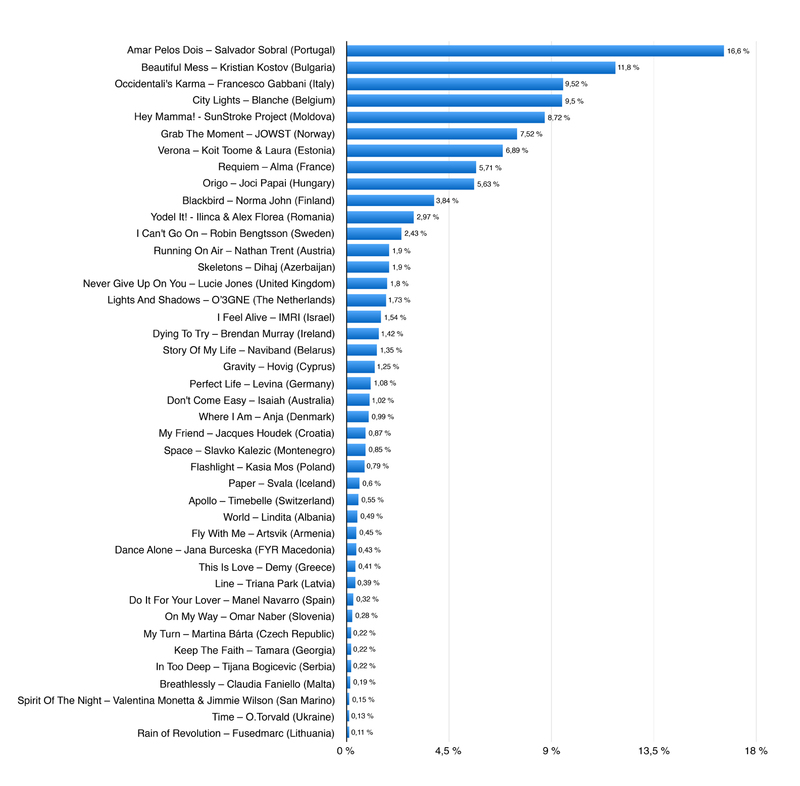 The Best Group voting sees a landslide victory for Moldova’s SunStroke Project who gained 24.7% of the vote, one of the best results ever achieved in this category. Runner-up in this category is JOWST from Norway. Joakim With Steen and Aleksander Walmann scored 15.2%, followed by O’G3NE from The Netherlands with 13.7%. Congratulations to all the winners! We will get in touch with them to hand over the trophies as soon as possible. For the complete rankings of the 2017 ESC Radio Awards, see below please. 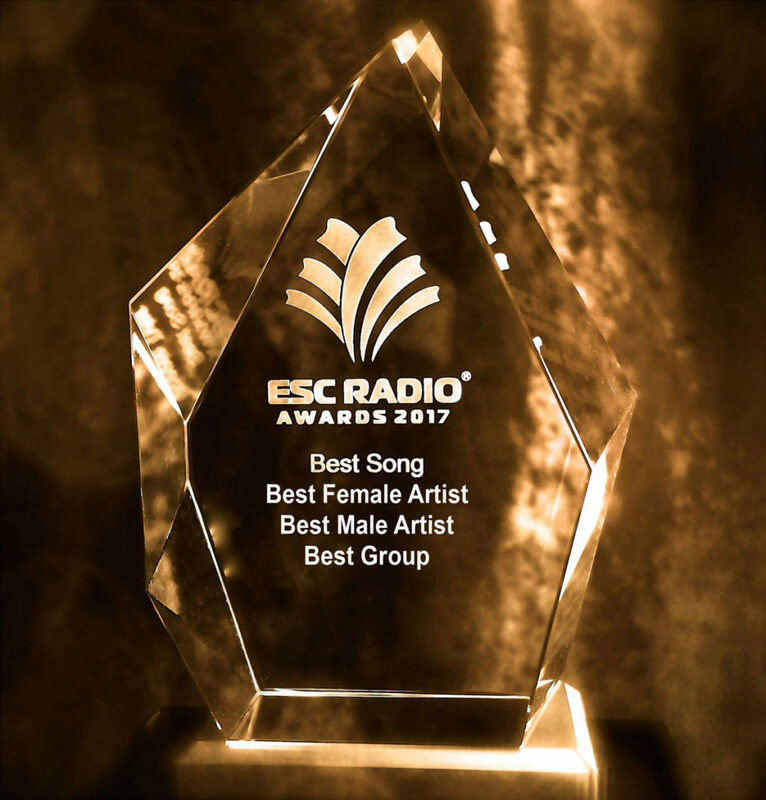 This entry was posted on Monday, June 12th, 2017 at 5:20 pm	and is filed under ESC Radio Awards, News. You can follow any responses to this entry through the RSS 2.0 feed. You can leave a response, or trackback from your own site.